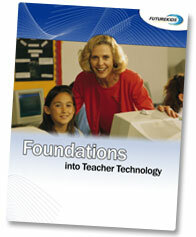 Foundations in Teacher Technology Education is a comprehensive, 45-hour course designed to train educators in the basic fundamentals of computer literacy, separately available in both K-8 and High School versions. The course is not designed to make participants experts on a specific software application, but rather to familiarize them with the basic concepts of operating systems, Internet, word processing, graphics, spreadsheets, desktop publishing, databases and multimedia. Both K-8 and High School versions are activity-oriented, relevant to the appropriate grade levels of the teachers involved, individually responsive and fun. Professional tasks (keeping grade books, creating lesson plans and communicating with various educational groups) and classroom teaching (complementing the current curricula) are addressed. Basic skills, methodology and pedagogy are covered at theoretical and applied levels. The program's content is based on the ISTE standards for computer technology literacy. Its proprietary methods are focused on a combination of project-based thematic learning strategies, which address skill development in the authentic contexts of the participants while attending to the personal attitudes and perceptions associated with learning new technology skills. The program's content is based on the ISTE standards for computer technology literacy. The program focuses on project-based thematic learning strategies while keeping in mind the participants' personal attitudes and perceptions associated with learning new technology skills.